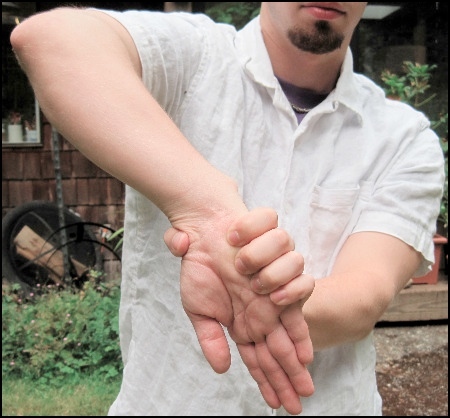 A good wrist stretch can work wonders for sore and stiff hands & wrists. 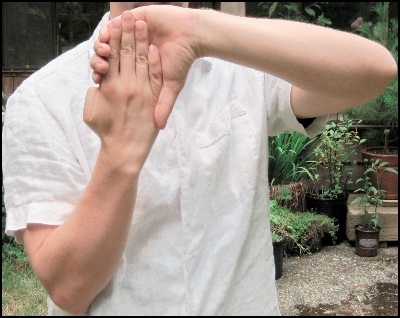 These wrist and forearm stretches will help all of your forearm muscles. Tons of people. Far too many people, really. People who work with their hands a lot are vulnerable to overuse injuries, inflammation, and trigger points. Pianists, violinists, swordsmen, people who type on computers, etc. 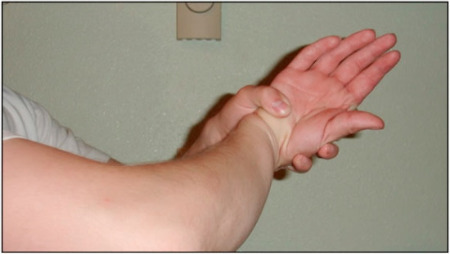 Tons of people should do forearm and wrist stretches, if only as preventive medicine to avoid injuries. Impact sports with rackets, bats, and similar hand-held equipment are particularly hard on the grip and forearm. The collision of whatever you're holding with a ball or target really jars those muscles and tendons, and can cause truly unpleasant things. ◆ Use these stretches as preventative medicine, or for light pain. 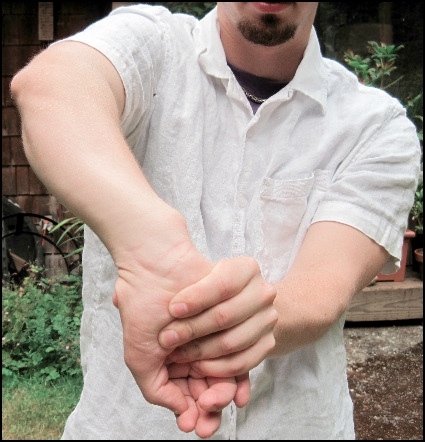 If you have inflammation in your wrists or forearms these stretches can be very painful and damaging as well. Make sure you're correct in your diagnosis of inflammation (not trigger points, structural damage, or something else). If you have muscular or tendon inflammation and/or structural damage, wait for that to heal before you do these stretches. ◆ Hold the stretch for at least 20 seconds for a basic stretch. If you're really trying to loosen stiff muscles or use the stretches for therapeutic effect, try 60 seconds or longer. ◆ You can do these anywhere, so do do them anywhere, anytime you want. They're convenient, free, and they feel great! ◆ Try as many or as few of these stretches as you wish. Find the one that fits your needs. ◆ When you're done stretching, shake out your hands!! This will get the blood flowing back into them and move them through their new (and larger) range of motion. I learned many of these stretches from studying Aikido and Japanese swordsmanship. While many of the stretches pictured here were originally designed as wrist locks to hurt and restrain bad guys (or to lead to spiritual enlightenment, take your pick) you can easily apply them to yourself for a good stretch. 1. Hold your hands out in front of you, palms up. 2. Grasp the back of your right hand with your left hand. 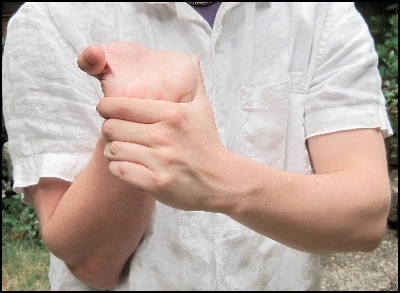 Your left thumb should be between the right ring finger and little finger knuckles, and the other left hand fingers will grasp around your right thumb. 3. 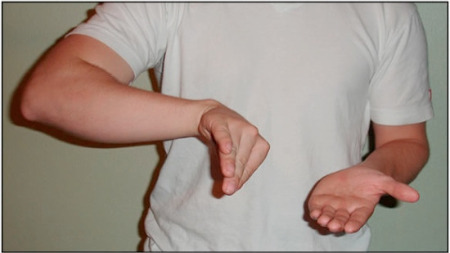 Pushing with your left thumb and relaxing your right wrist, turn your right hand palm towards your right until you feel a stretch in your right wrist. 2. 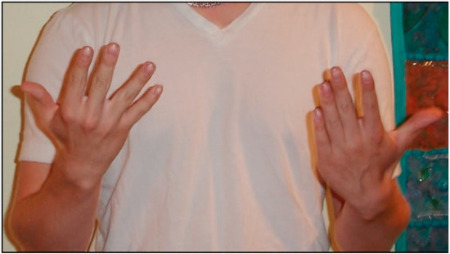 Rotate your right hand to a palm down position, and then keep turning it as far as you can. 3. 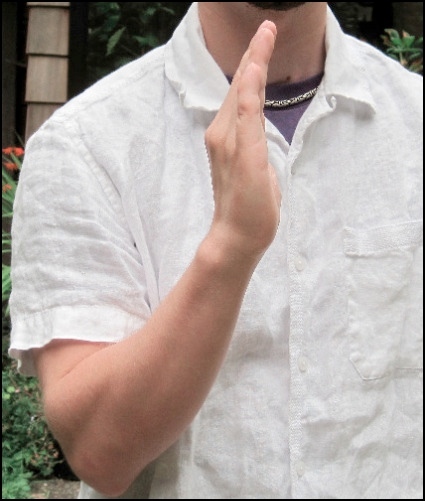 Grasp your right hand with your left hand, thumb over the top. 4. Keeping a right angle in your right wrist, use your left hand to attempt to point your right hand fingers up towards your head. 1. 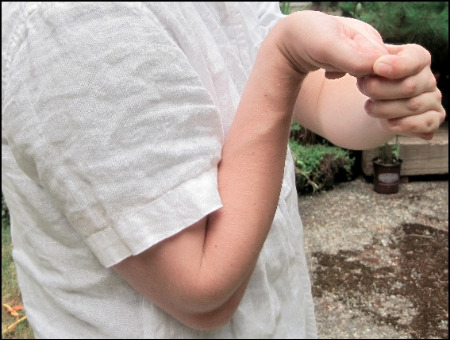 Hold your right forearm upright. 2. 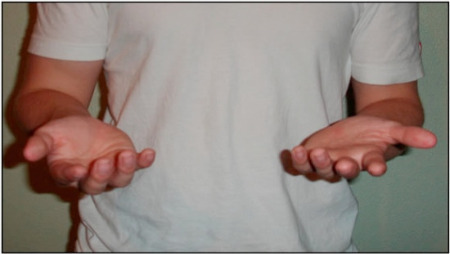 Place your left hand on top of your right hand and push your right hand towards your right forearm. 1. Hold your hand upright, palm towards yourself. 2. With your left hand grasp the fingers of your right hand. 3. 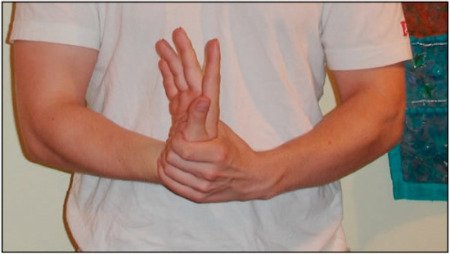 Use your left hand to bend your right hand backward. 1. 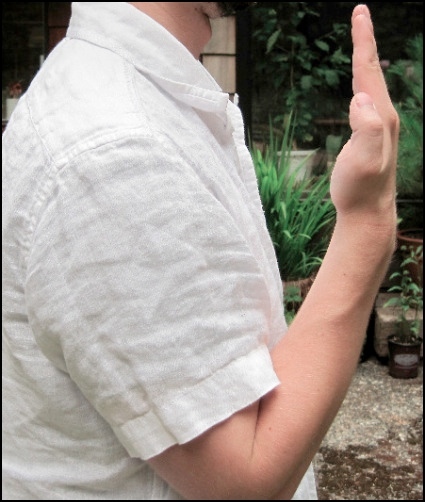 Hold your right hand upright, palm towards yourself. 1. 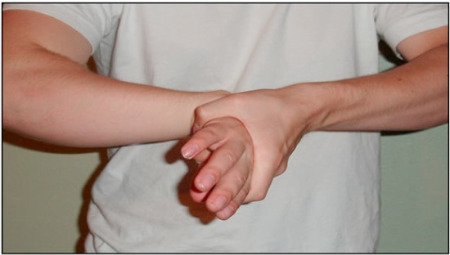 Holding both hands in front of you, grasp the top of your right hand with your left hand. 2. 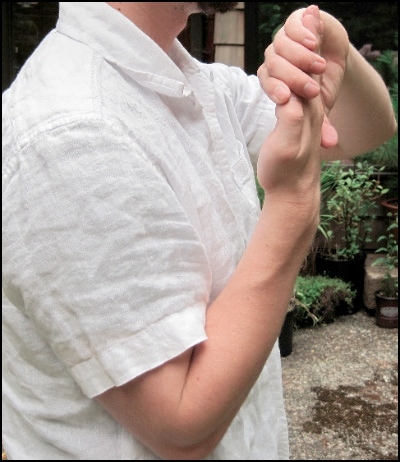 Use your left hand to turn your right hand towards the outside and up, and rotate the elbow upward. 3. Use your left hand to bend your right hand or fingers back toward yourself, stretching your right wrist and pointing your elbow upward as much as (safely) possible. 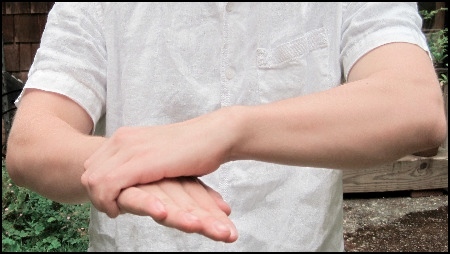 • Click here to leave 'Wrist Stretch & Forearm Stretches for Flexible, Pain-Free Hands' & go back to the Home-page! 1. Chabut, LaReine. 2007. Stretching For Dummies. --For Dummies. Chichester: Wiley. Pp. 64. 2. Anderson, Bob. 1980. Stretching. Bolinas, Calif: Shelter Publications. Pp. 54-5. 3. Chew, Ming, and Stephanie Golden. 2008. The Permanent Pain Cure: The Breakthrough Way To Heal Your Muscle and Joint Pain For Good. New York: McGraw-Hill.Pp. 133. 4. Cooney, William P., R. L. Linscheid, and James H. Dobyns. 1998. 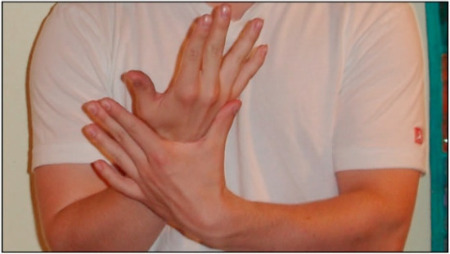 The Wrist: Diagnosis and Operative Treatment. St. Louis: Mosby.Pp. 124.